There are a lot of things that set my church, The Church of Jesus Christ of Latter-day Saints, apart from other churches. One big one is that our church congregations are run by its members. We do not hire our spiritual leaders, teachers, choristers, custodians, pianists, etc. The members are asked to, or called, to do these responsibilities for a time. These callings are given through inspiration, and as members, we are given the opportunity to accept those calls. In December 2014, I was called to be the Primary Secretary in my ward (congregation). Primary is the organization for children in my church. We have a Nursery program for ages 18 months to 3, and then the official Primary program for ages 3-11. When I first was extended the call, I admit I wasn’t excited. I had done this calling before in another ward, and it was mostly paperwork and organizational stuff. But, I accepted the calling out of obedience, and a willingness to serve in whatever way I could. Fast forward to September 18, 2016, the day I, and the rest of the Primary presidency of my ward, got released from our duties. It was the day of our yearly Primary Program, where the children ages 3-11 get up in front of our congregation to sing songs they have learned all year, and present speaking parts about spiritual topics also learned that year. The day of the Primary Program is one of my favorite Sundays each year, and this past one was extra special because it would be my last one in the presidency. I was so proud of the children, and my love for them spilled out through my tears. I couldn’t hold back the emotion that day as I was released. I sat quietly during my last Sunday in the Primary room with them, sad I would be leaving them, and that I wouldn’t be able to teach them anymore. In the past year and nine months, I have learned so much from these wonderful Primary children, and from serving as Primary Secretary. It is a calling I am so grateful I had because, not only was I able to assist in keeping our Primary dealings organized, I was able to collaborate with the other sisters in my presidency on many issues, like activities, callings, and needs of children. I was also able to teach the children periodically (my favorite part), sing the songs with them, and just get to know and love each child. They are helpful. When something falls, or there are chairs to be put away, there are kids always willing to lend a hand. They love to participate. Some of the kids would come to me asking, sometimes practically begging, to say a prayer, recite a scripture, or give a talk. Others would get upset if not asked to participate enough as sticks were pulled out of the bucket to choose helpers. They like to tell stories about their lives – and usually those stories correlate with the lesson. I loved hearing about the kids’ missionary, service, or family experiences. They often brought tears to my eyes. They are loving and compassionate. One little boy always wanted to give me a hug each week. I always looked forward to those hugs and his sweet voice. I can think of a couple times, too, where I got emotional in Primary after teaching a lesson and bearing my testimony. There would inevitably be kids who wanted to make sure I was okay, and I loved them even more than I already had before. They work well in competitive scenarios. Once, I was substituting as chorister, and the kids were singing very quietly. I told them that I could hear myself over all of them. I admitted I sing loud, but with that big group, they should have been able to at least sing as loud as me. And you know what? They rose to the challenge and sang their little hearts out. After that time, I often reminded them they could sing as loud as Sister Al-Bjaly. They have a hard time sitting still and staying quiet sometimes. Why did I admire this? Well, in the moment, maybe I didn’t. But, it helped me gain some understanding and patience as I realized that these are good kids – it is just really hard to stay reverent for three hours at church. It brought perspective as I thought about adults who can’t sit still or stay quiet that long either. For all we expect of them, they really do a fine job. They try even when they are afraid. My heart melted over and over seeing the little ones get up, sometimes for the first time, to the podium to deliver their talks, prayers or scriptures. Sometimes, they wouldn’t say a word, but would lean on their parents for support. Even when their parents would say their part for them, I was so proud of them just for getting up there. I know adults who won’t give talks or prayers in church, but these little ones will at least get up and try. They find joy in singing. Well, maybe not all of them, but most of those kids really open up through song. They haven’t gotten to an age yet where their singing voices embarrass them, and they think they aren’t good enough to sing. No, regardless of singing talent or even knowing the words, most of the kids sing, sing, sing. And I love it! They have good parents who teach them the gospel of Christ. This was incredibly apparent to me, especially as I taught lessons. I was amazed at how knowledgeable the kids were about the scriptures and their heroes, how many answers they knew without thinking, and how many spiritual experiences they recognized in their lives and in the lives of their families. They feel and recognize the Holy Ghost. Even though there were definitely some days where the kids were loud and seemingly out of control, sometimes they would hush. They would become contemplative. They would get serene looks on their faces. I recall more than once at the end of a lesson (sharing time) or singing time, the kids would be uncharacteristically quiet. It was a beautiful noise, because it accompanied feelings of God’s love and peace. One time, (I think it was the last time I taught them), I ended my lesson by singing a duet of I’m Trying to Be Like Jesus with one of our talented young 10-year-old ladies. I felt the Spirit as I sang with her, and as we finished, you could hear a pin drop. It wasn’t necessarily our voices, but the praises we sang, that helped the children feel that Jesus really does love them, and that we can all be like Him. I just love Primary. I felt Heavenly Father’s and Jesus’s love for them and for me over and over again as I sat and watched them, helped them, taught them, or sang with them. It has been hard the last few weeks not being with them, but I know the Lord has another responsibility waiting for me. I will do my best to fulfill whatever it is, for I know it will be for my spiritual good. Thank you, dear Mebane Ward Primary children, for all you have done for me! 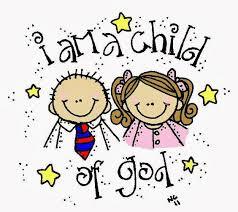 You are special children of God!